Love at first bite..: Mutter Kachori - Khandan ki Virasat! Mutter Kachori - Khandan ki Virasat! Story: Anyone familiar with Bollywood movies can easily remember lines such as: "Main tumhe jaydaad se bedakhal kar doonga!" or "Kutte, Kamine, Main tera khoon pi jaunga!" or "Beti, ye lo kangan.. mere maa ke hai.. maine apane bahu ke liye sambhal ke rakhe the!".... I can go on forever..
Today's recipe for Mutter Kachori is one such Virasat! Passed on from my hubby's par-nani to his nani to his mom to his sister and to me!!!! Main ye mahan virasat aaj tum sab ko de rahi hun! Source: Shank's par-nani to nani to MIL to me! Time: Takes a long time! - preferably split over two days..
Roast coconut and cumin powder on a pan until the coconut gets a light brown color and you can smell the aroma of heated cumin seeds. Then grind this mixture to a dry masala and keep it aside. Grind peas, ginger, garlic and green chilies into a non-uniform paste. Heat 1/2 cup oil in a large pan and add this mixture to the oil. Saute patiently on low-medium heat for 30 minutes or so. Towards the end - as the mixture becomes more and more dry, add the coconut-cumin masala and salt to taste. Mix well and saute for another 5 minutes. Let this kachori mixture cool down to room temp. In the mean time, you can mix the dough for the coating of the kachori.. Mix maida, Oil, lemon juice and salt. Add water as needed to get a soft dough. Keep the dough covered for a couple of hours. Now the assembly - flatten the dough into small (3 inch diameter) circles. Add 2 tsp of kachori mixture and close the dough to form a stuffed ball. Lightly press this ball to flatten the kachori. You can make these kachoris in advance and store them in the fridge for at least a couple of weeks. Defrost and deep fry till golden brown when you want to serve these. Serve with Tamarind-date chutney and thin shev. 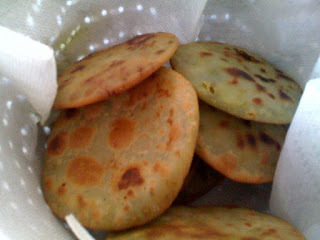 Or you can serve it Indore's Baluchi kachori style, with finely cut onion, coriander and chilies and shev and chutney! today's story wins the award for the best story on the blog so far. no par-nani had ever imagined their creations would be *blogged* in the future. Shanu, a healthy non-fried version sounds really good.. that way I can make these more often. with your permission (and nani's blessings)... can I add link to this post in my next blog post!! Wonderful!!!!! Good to see such Virasat main aayi recipes. I know how proud you must be feeling while writing this post. I think I will try the baked version as well! :) and good timing since the season is just right for good, fresh matar..
wow.. I am clearly getting old.. Sakshi it took me a while to read your comment with all the short forms. Now that I have understood it.. thanks a lot for the compliments! :) keep visiting.